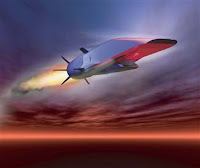 The X-51A is powered by a Pratt Whitney Rocketdyne SJY61 scramjet engine, which is designed to ride on its own shockwave and accelerate to about Mach 6. U.S. Air Force. An experimental aircraft has set a new record for the longest hypersonic flight after streaking across the sky Wednesday for more than three minutes while flying at Mach 5 — five times the speed of sound — the United States Air Force has announced. The vehicle, called the X-51A Waverider, dropped from a B-52 Stratofortress mother ship while flying over the Pacific Ocean just off the southern California coast. It successfully ignited an air-breathing scramjet engine than accelerated up to Mach 5, Air Force officials said in the announcement.